The Thank You Economy is about something big, something greater than any single revolutionary platform. It isn’t some abstract concept or wacky business strategy — it’s real, and every one of us is doing business in it every day, whether we choose to recognize it or not. It’s the way we communicate, the way we buy and sell, the way businesses and consumers interact online and offline. The Internet, where The Thank You Economy was born, has given consumers back their voice, and the tremendous power of their opinions via social media means that companies and brands have to compete on a whole different level than they used to. 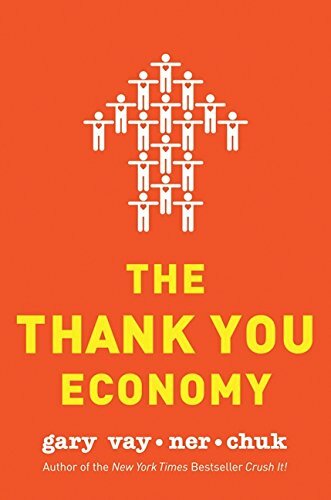 Filled with renowned entrepreneur Gary Vaynerchuk’s irrepressible candor and wit, as well as real-world examples of companies that are profiting by putting Thank You Economy principles into practice, The Thank You Economy reveals how businesses can harness all the changes and challenges inherent in social media and turn them into tremendous opportunities for profit and growth. Companies of all stripes and sizes have to start working harder to connect with their customers and make them happy, not because change is coming, but because it’s here.The cultural changes social media have ushered in are already having a big impact on marketing strategies, but eventually, companies that want to compete are going to have to change their approach to everything, from their hiring practices to their customer service to their bud- gets. Not all at once, but it will have to happen, because there is no slowing down the torpedo-like speed with which technology is propelling us into the Thank You Economy –– and that’s a good thing. Corporate America loves e-commerce now, of course, but business leaders, brand managers and marketers have simply drawn new lines in the sand, this time putting distance between their companies and social media, all the while desperately clinging to the security that they still believe numbers can provide.Unfortunately, if you wait until social media is able to prove itself to you before deciding to engage with your customers one-on-one, you will have missed your greatest window of opportunity to move ahead of your competitors. 1. There’s no return on investment (ROI). It’s very logical: There is proven ROI in doing whatever you can to turn your customers into advocates for your brand or business. The way to create advocates is to offer superior customer service. In the Thank You Economy, a key component of superior customer ser- vice is one-to-one engagement in social media. It’s what customers want and, as we all know, the customer is king. 2. The metrics aren’t reliable. The tools for tracking and measuring social media initiatives are becoming increasingly sophisticated and reliable. After all, this data is coming from Nielsen. In September 2010, Nielsen announced it was launching a cross-media metric tool that will measure a campaign’s effectiveness online with ratings data comparable to that already offered for TV. 3. Social media is still too young. Embarking on one-to-one customer engagement offers significant long term rewards, but the company will also experience immediate benefits — greater brand awareness, stronger brand loyalty, increased word of mouth, improved understanding of customer needs and better, faster consumer feedback — and suffer very few drawbacks, if any. Meanwhile, the drawback to resisting social media engagement is clear: The longer you wait, the farther the competition can pull ahead. 4. Social media is just another trend that will pass. The growth and technological shifts we are experiencing today have a faster and greater impact on business than they used to. You can’t expect any product’s penetration to follow the same pattern that, say, the Walkman did 30 years ago. 5. We need to control our message. Overall, problems can be fixed if you catch them in time. If you plead your case quickly and sincerely, you’ll gain back the customers’ trust, as Ann Taylor did. When Ann Taylor LOFT introduced their silk cargo pants on their Facebook page in the summer of 2010, a wave of online customers complained that no one except a giraffe-sized, skinny model could possibly look good in them. To prove them wrong, LOFT employees of all heights and sizes posted photos of themselves wearing the pants. The response was extraordinary: Tons of comments from women thanking LOFT for listening, some even admit- ting that they might wear the pants. 1. Begin with yourself. Since culture stems from the top of a company, one would hope that the top executive has a good sense of who he or she is. Strong self-awareness makes a strong culture possible. 2. Commit whole hog. The mental commitment is probably even more important than the financial com- mitment, especially in the early stages of preparing a company for the Thank You Economy. 3. Set the tone. As soon as leaders commit to build- ing a caring culture, they need to send a strong, direct message about their intent. Employees should be able to feel the difference immediately, and they should be able to look to their leaders for examples of the kind of care, concern and one-on-one interaction with customers that will be expected of them. 4. Invest in employees. Create a culture that rewards people who show that they care. Seek the input of people who have shown a tendency to take risks and share big ideas. 5. Trust your people. Creating a Thank You Economy culture will become easier and easier as you begin hiring people who share your commitment to caring. 6. Be authentic. With the power of social media to spread articles, images, videos and audio recordings around the world in minutes, authenticity and the long- term relationships that can result from authentic interactions with consumers will almost always be the deciding factor in how a brand or company survives a false step in the Thank You Economy. Care — about your customers, about your employees, about your brand — with everything you’ve got. Erase any lines in the sand — don’t be afraid of what’s new or unfamiliar. Show up first to market whenever possible, early the rest of the time. Allow your customers to help you shape your brand or business, but never allow them to dictate the direction in which you take it. Build a sense of community around your brand. Arrange for traditional and social media to play Ping- Pong and extend every conversation. Direct all of your marketing initiatives toward the emotional center and the creative extremes. Approach social media initiatives with good intent, aiming for quality engagement, not quantity. Use shock and awe to blow your customers’ minds and get them talking. If you must use tactics, use “pull” tactics that remind consumers why they should care about your brand. If you’re small, play like you’re big; if you’re big, play like you’re small. Create a sense of community around your business or your brand. Don’t be afraid to crawl before you run. Mar 14 Things you need to know about the book " The Rare Find"
Mar 15 Things you need to know about the book " Taking People With You"